Hawaii students in sixth through 12th grades want to evaluate their teachers, they favor year-round schools and oppose raising the driving age to 18 from 15. They want soda sold on campuses and canoeing and surfing added to their competitive interscholastic sports programs. Those were among results of the Kids Voting project held at most polling places on the islands yesterday. 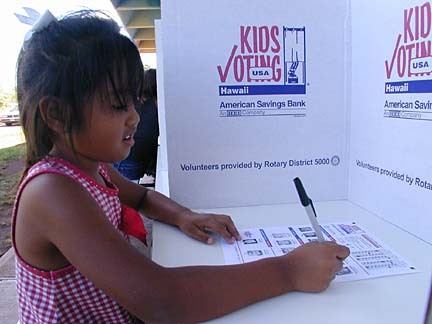 The Hawaii project, sponsored by American Savings Bank, is part of a national effort to educate students about democracy and the importance of voting. All students from kindergarten through 12th grade were eligible to vote for candidates. Sixth- through 12th-graders were asked for opinions on various issues. The presidential contest was nearly as tight among the kids as their parents across the country: Democrat Al Gore received 47.2 percent of their votes; Republican George W. Bush 45.1 percent. Hawaii's congressional incumbents, Sen. Daniel Akaka and Reps. Neil Abercrombie and Patsy Mink, received overwhelming student support. They chose former Big Island civil defense chief Harry Kim as the county's mayor with 43.6 percent of the votes. Their Board of Education winners: Denise Matsumoto, Michael Nakamura, Marilyn Harris, Lex Brodie, Carol Gabbard, Randall Yee, Herbert Watanabe, Meyer Ueoka and Mitsugi Nakashima. Should students evaluate teachers? 11,397 yes; 3,175 no. Should theft and vandalism committed to school property carry more severe punishment than the same crimes committed elsewhere? 7,374 yes; 6,959 no. Should soda be sold on school campuses? 12,377 yes; 1,970 no. Should driving age be raised from 15 to 18? 4,655 yes; 9,588 no. Should canoeing and surfing be established as competitive sports in the Hawaii interscholastic sports program? 12,194 yes; 1,966 no. Should schools operate year-around? 7,307 yes; 6,938 no.